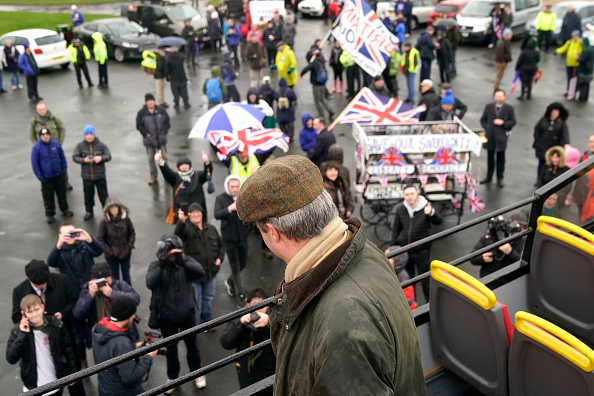 Leave Means Leave co-chair Richard Tice has claimed Nigel Farage's 'Brexit betrayal' march was never "about the numbers". His comments came amid mockery of the small number of marchers that turned up to take part in the 270-mile walk from Sunderland to London. Appearing on the breakfast show, Mr Tice said: "It's not about numbers, it's about the symbol. We're representing 17 million Brexiteers who are being betrayed by this appalling proposal from the Prime Minister." Around 100 marchers were pictured taking part in the first leg of the journey on a drizzly Saturday. "It was indeed a soggy start, that shows true grit. If it had been the People's Vote they would have delayed it a day. We pushed on through and that shows the spirit of Brexiteers." The businessman continued to slate the anti-Brexit People's Vote campaign, which Alastair Campbell is involved in. "We don't need to lie about our numbers like the People's Vote campaign," Mr Tice added. "We are honest about our numbers, we're deliberately keeping it tight."